NEW YORK, June 14, 2018 /PRNewswire/ -- Ascend Foundation hosted their second annual charity golf outing at the fairways of Manhattan Woods Golf Club at West Nyack on June 5, 2018. More than 100 participants from the largest Fortune 500 companies competed for the prizes, including a brand new BMW convertible. The event's honorees, Lesley Ma, Global CIO at Cadillac, a division of General Motors and Rajive Johri, Board Director at Conagra Brands, Inc. received the Ascend Trailblazer Awards. From L-R: Kate Seitz, Partner, Financial Services Group, RSM US LLP; Jeff Chin, President, Ascend Foundation; Rajive Johri, Board Director at Conagra Brands, Inc.; Hee Lee, Co-Founder of Ascend, Chair of the Ascend Golf Outing Steering Committee, and Partner, EY; and Savio Chan, President & CEO, U.S. China Partners, Inc., Chairman of the Ascend Golf Outing and Best-Selling Author of "China’s Super Consumers" at the Second Annual Ascend Charity Golf Outing. From L-R: Hee Lee, Co-Founder of Ascend, Chair of the Ascend Golf Outing Steering Committee, and Partner, EY; Jeff Chin, President, Ascend Foundation; Lesley Ma, Global CIO, Cadillac; Kate Seitz, Partner, Financial Services Group, RSM US LLP; and Savio Chan, President & CEO, U.S. China Partners, Inc., Chairman of the Ascend Golf Outing and Best-Selling Author of "China’s Super Consumers" at the Second Annual Ascend Charity Golf Outing. 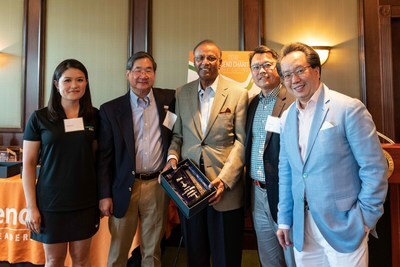 The event raised approximately $140,000 to further the mission of the Ascend Foundation, the nationally-recognized 501(c)(3) non-profit organization with a mission to educate, advocate, and enable Pan-Asian business leaders to reach their full potential. The Foundation's goal is to make a difference in the Pan-Asian community through research, thought leadership, scholarships and education. "We are proud to announce that this year's golf outing was our largest yet with more than 100 participants and the funds we raised will help the Ascend Foundation to continue its important work," said Savio Chan, President & CEO, U.S. China Partners, Inc., Chairman of the Golf Outing and best-selling author of China's Super Consumers. "Thanks to the generosity of the many organizations and individuals who made it successful, we are able to make a significant difference in the Pan-Asian community." "Our Ascend family continues to expand and the Ascend Charity Golf Outing has become an important annual event," said Jeff Chin, President of Ascend Foundation. "Our two honorees, Lesley Ma and Rajive Johri are both incredible Pan-Asian trailblazers and role models and I'm delighted to highlight their role in advancing our community's presence and influence." "It's such an honor to host our sponsors and participants, our two honorees, the EY and Ascend teams, and all the volunteers at our annual Golf Outing. From beginning to end, I was impressed with the overall energy and excitement! 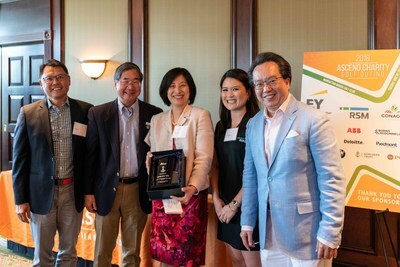 Thank you to everyone who made it possible," said Hee Lee, Co-Founder of Ascend, Chair of the Ascend Golf Outing Steering Committee and Partner, EY. Ascend Foundation is a 501(c)(3) organization with a mission to educate, advocate, and enable Pan-Asian business leaders to reach their full potential and provide scholarships to honor students who demonstrate scholastic excellence, leadership, and commendable community service. Ascend (@AscendLeader) is the largest, non-profit Pan-Asian membership organization for business professionals in North America. Established in 2005, Ascend, a career lifecycle organization, reaches 60,000+ senior executives, professionals, and MBA/undergraduate students involved in its 50+ chapters in the United States and Canada. Visit http://www.ascendleadership.org for more information.